The Fourth Monkey is out on June 27th and is available to pre-order NOW!!! I was lucky enough to read and review an early copy of this book, and it’s definitely one to look out for in 2017! 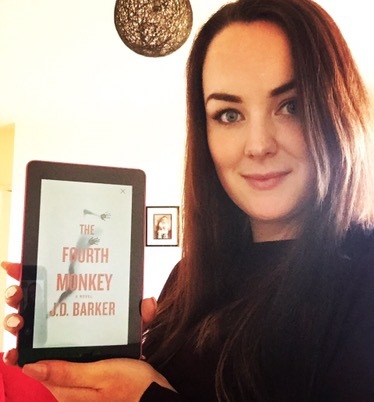 Initially, apart from the blurb and a cracking recommendation from author Lisa Hall, I didn’t know much about The Fourth Monkey. I had no real expectations going into the book, other than I had heard it was twisted, so needless to say I was looking forward to reading it. The Fourth Monkey is a crime thriller featuring Detective Sam Porter, and it is eerily reminiscent of early Jeffrey Deaver. There are echoes of The Bone Collector whispering through the pages of this book, which is very exciting to see as it shows the author has some serious writing skills. As usual, no plot dissection or spoilers here. The Fourth Monkey is creepy, atmospheric and completely compelling. Excellent characterisation and a twisty turny plot make this an enthralling crime thriller. I loved the concept and I think J. D. Barker has a knack for keeping the reader turning the pages. To be in with a chance to win a draft copy of#4MK, all you have to do is get a selfie with you holding the book or proof of purchase and put it out on social media! I got this one today ❤ So excited!